This afternoon, I was going through a box of accessories that I found in the bottom of my wardrobe. The majority of it was shoeboxes that either did or did not contain the correct style and quantity of shoes. That has now been sorted, and the bottom of my wardrobe is eagerly awaiting all the right boxes of shoes going back into it later today. In one shoebox, I found loads of costume jewellery and pieces of jewellery that I’d made (I make jewellery) along with one or two “real” pieces that were made of gold. In amongst it all was a box from F Hinds that I bought in late 2012. It was supposed to contain a 9 carat gold bangle that I only ever wore the once. I always kept it very carefully put away ready for special occasions. I took it out to have a look at it. It’s been stored in its original box all this time. The big blob of corrosion is center top. As you can see from this photo, it’s got a huge green glob of corrosion on it. 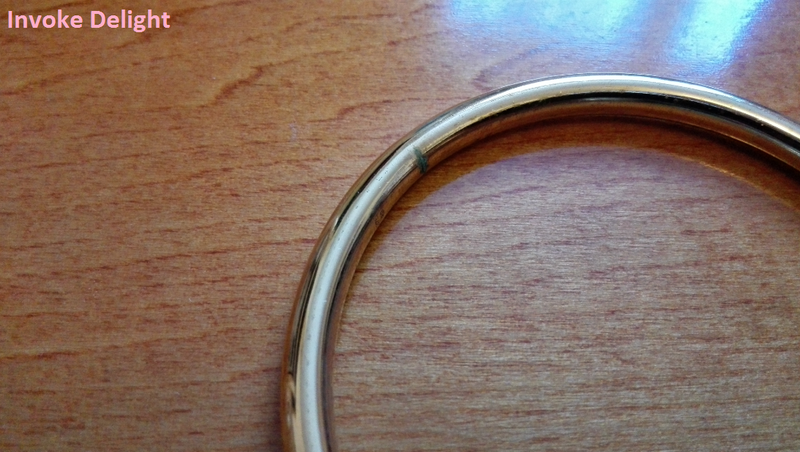 What you can’t see are the additional splodges that almost look like grease spots on the surface of the gold, which are all over the bangle. Second photo, so you can see it’s not a trick of the light. Let’s just think about this for a minute. If treated correctly, hollow gold, solid gold, even gold plate and rolled gold (and gold fill) should all be able to last a lifetime. 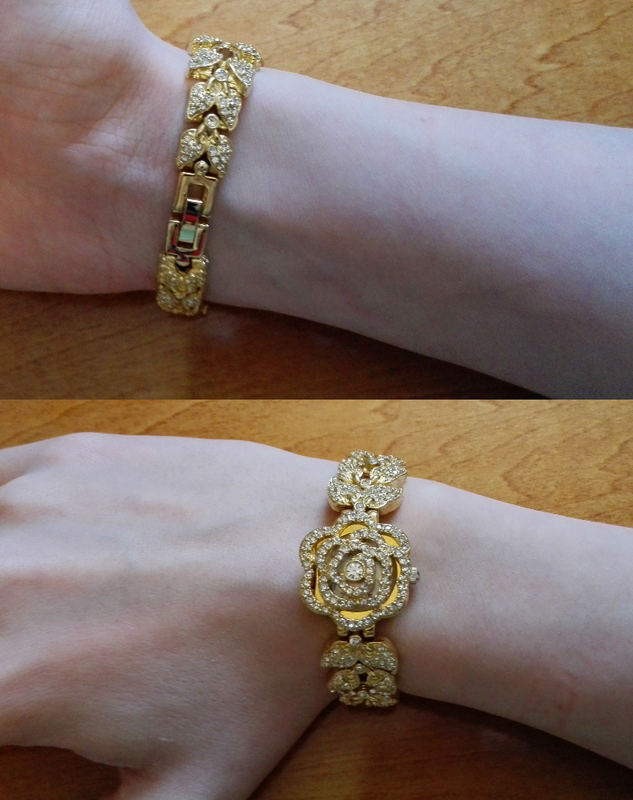 I bought a couple of Gold Fill bracelets from China at the same time as this bangle, and I also bought a gold plated watch. Guess what? The Gold Fill and the gold plate are both still in perfect condition. All I can see from the evidence in front of me is that F Hinds must be making inferior jewellery. To the mass produced Chinese stuff. Whuuut?? This is the gold plated watch. As you can see there’s no corrosion here. I feel very shocked and let down that a reputable high street jeweller is making and selling jewellery of such poor quality (and let’s face it, they don’t sell it at Argos prices). You think you’re going to get something of higher quality from them because of the price of their items and the fact they have a fancy high street storefront. Sadly, because they only have a 12 month guarantee on their items, and I’ve only just discovered the problem, they won’t refund, exchange or even give me store credit. 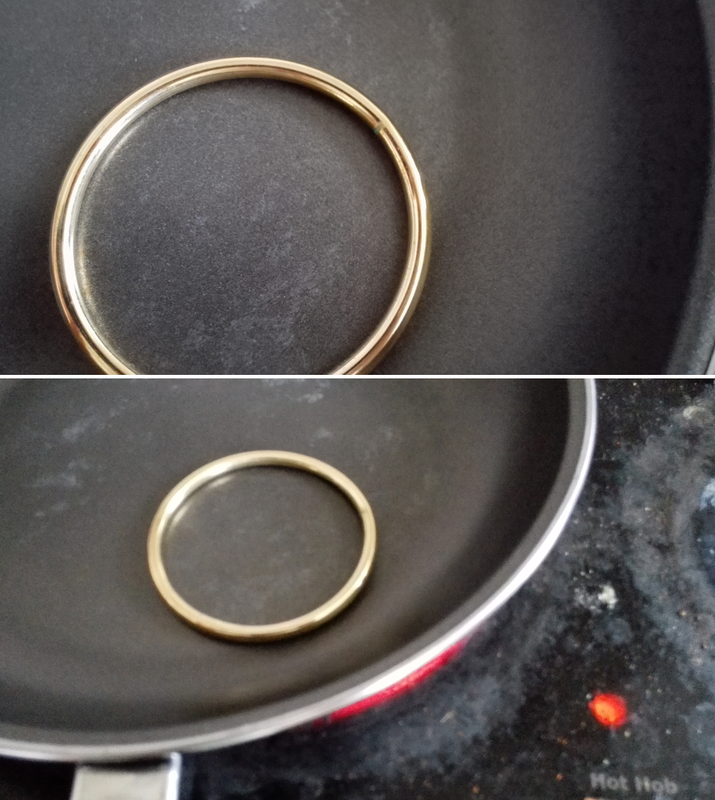 Just to make absolutely certain that this wasn’t a gold chloride compound (God only knows where the chlorine would have come from when it’s been in a box in a box unless there’s chlorine emissions from the packaging they sell it in), I decided to heat the bracelet gently on the stove. This should decompose gold chloride back to solid gold and chlorine gas (making it look as good as new). I heated it for about three minutes then allowed it to cool. I took photos during and after the process. Definitely not a gold chloride compound, this shows that another metal may be present or that the alloy did not form properly. It didn’t change, and there was definitely no chlorine smell, which would have been a key sign that any reaction was taking place. I have a silver ring which I bought from H Samuel in 2007 that hasn’t got one single speck of corrosion on it, and silver is supposed to tarnish more quickly than gold. If you remember anything from school chemistry, you should know that gold is less reactive than silver, because gold is almost completely unreactive. If you buried a lump of gold in the ground, it should look the exact damn same in 1000 years’ time. There is a litany of evidence of this actually happening. The gold in the pyramids of Egypt are about 4,000 years old and they have plenty of gold in them, in perfect condition. It’s not a fluke, either. As an archaeology graduate and a chemistry-specialist science teacher, I actually cannot believe that anyone has managed to make a gold that corrodes. This gold was hallmarked and therefore should not have corroded like this. I can’t say all their jewellery will be the same. 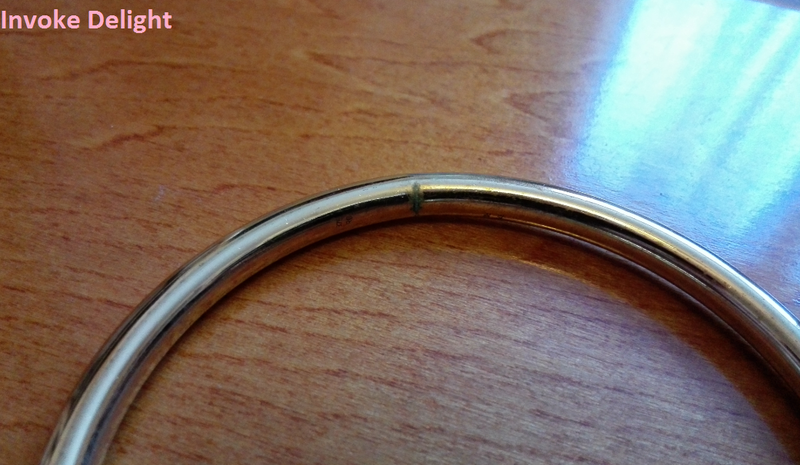 Perhaps my bracelet just had a manufacturing defect, but if this is the case it should have a guarantee period that allows time for the defect to become apparent, because corrosion to a metal doesn’t happen overnight (unless you dunk it in aqua regia). Even though it’s an alloy (because it’s 9 carat not 24 carat) it should not corrode like this. I feel like I’ve lost something that was special to me. What I will say, however, is that I’m really REALLY glad I didn’t buy my wedding ring from them – their diamonds are only guaranteed for 2 years and their other jewellery is only guaranteed for 12 months. So I’m going to take my custom elsewhere in the future because I am totally unwilling to pay over the odds for jewellery that’s designed to fail after 12 months, and I don’t feel I can trust them now. That bracelet cost a lot of money. I never in a million years thought that jewellery could be part of the Planned Obsolescence manufacturing movement. On a brighter note, I have managed to downsize my jewellery (mostly costume anyway) to only contain the things that fit into my jewellery box, with everything else separated into “throw or donate” piles, and the things that I no longer want will be donated to charity shops. As for the rolled gold bracelet, I will give it to the PDSA charity shop (they help pets who need vets), in the hope that someone will see its condition and pay a reasonable price for it, and it will probably make them very happy to own, whilst also giving valuable funds to a charity that helps animals. We also got rid of 180 books yesterday along with four bags of clothing that were the culmination of my book downsizing project over the last few weeks – I’ve been reading the first 10 pages of every book in the house to decide whether to keep it or not, after I’d taken as many as I could be sure of to the charity shop (about 100 that I knew I didn’t need to check, they just left the house). 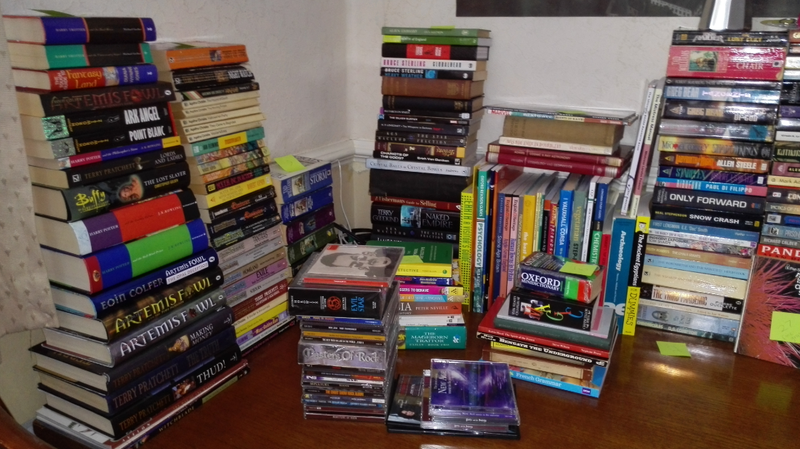 This generated about 230 books to get rid of. 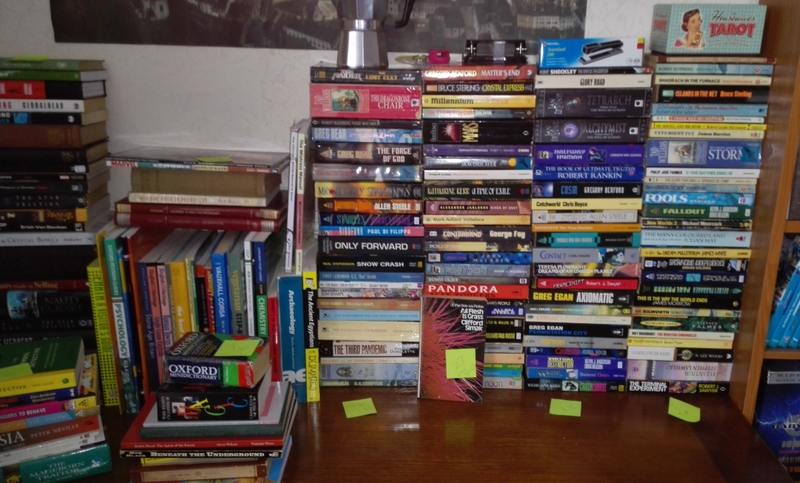 We had a book sale last Saturday to get rid of any to people who might want them, and have gotten rid of the remainder yesterday, leaving us with a few that people are going to pick up at some point in the near future. If they aren’t collected within 7 days, we are donating them as well (but there’s only about 50 waiting now). We got rid of all but the pile on the far left, as well as some bags of clothing (not shown). We took them to the charity shop to pass on to other people. The answer to the eternal question of underwear. It turns out you need far less than I had (who didn’t see that coming), and I’ve now got about two weeks’ supply of both, while still keeping variety (e.g. tights, stockings, socks) because I don’t want to wear everything that I have in a precise rotation of clothing (that’s way too prescriptive for me), I simply wanted a functional set of objects that had me covered for every type of clothing that I own. 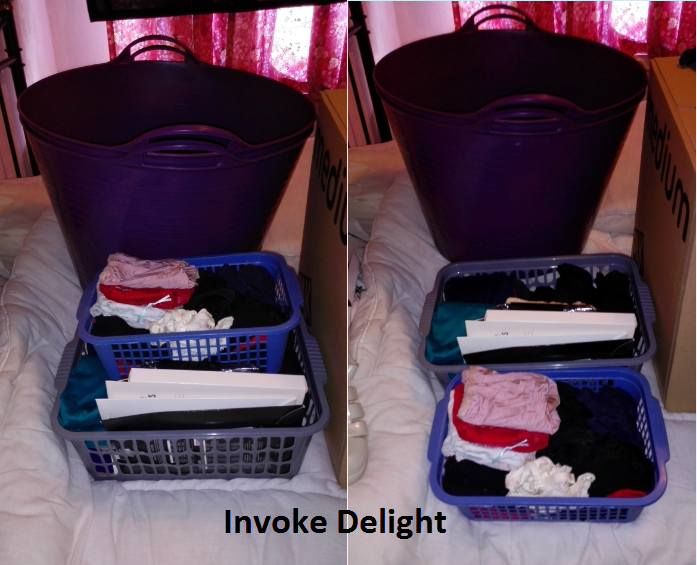 Now I just need to get into the habit of doing the laundry more regularly. 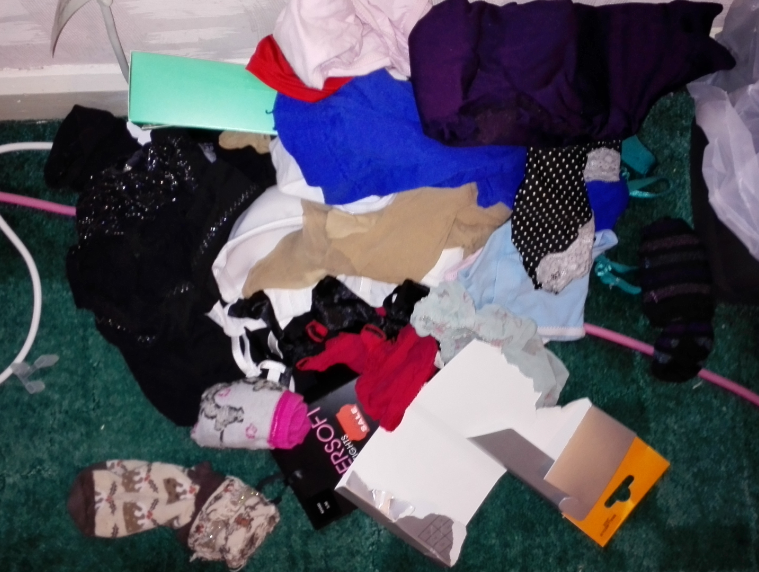 Having said that, a lot of the stuff I threw out was things I haven’t worn in a long time, or I balk at the idea of wearing if I ever pull it out, so I think I’ve probably been wearing exactly what I’ve kept anyway, so it might not affect my laundry-doing habits. And here are the losers. They all went to the bin because I can’t stand the idea of second hand underwear. I’m going to go and put the washing machine on now. Previous Previous post: Dry Skin? Have you tried macadamia oil?